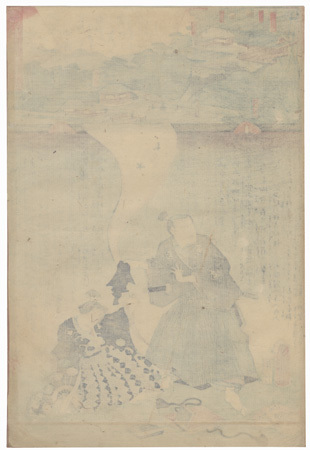 Miracles of Kannon - This large, 1858 - 1859 series designed by Toyokuni III and Kunisada II in collaboration with Hiroshige II pairs miracles performed by Kannon, the Buddhist Goddess of Mercy, with scenes of temples in the Western, Central, and Eastern provinces of Japan. 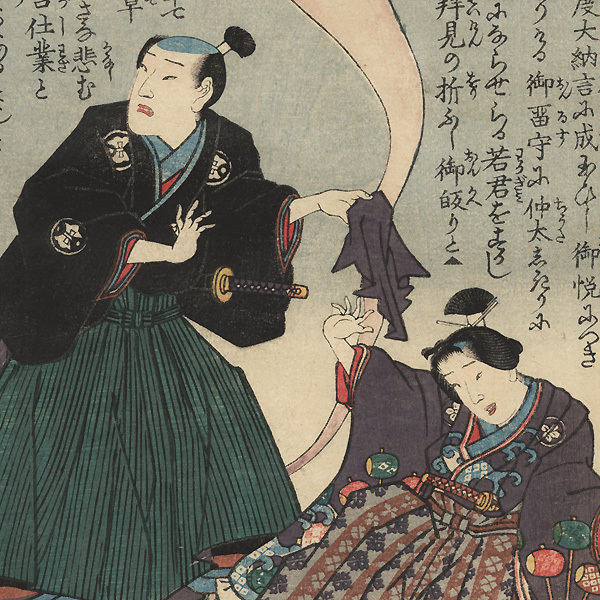 Toyokuni III created the large figural scenes at the bottom of each image for most of the series, with Kunisada II contributing a few designs, while Hiroshige II designed the landscapes across the top of each print. A wonderful combination of expressive figures and lyrical scenic views, these interesting prints feature lively color and fine detail. A handsome, unusual series, and a great choice for collectors interested in classic Japanese tales or Buddhist imagery. Shoshasan in Harima Province, No. 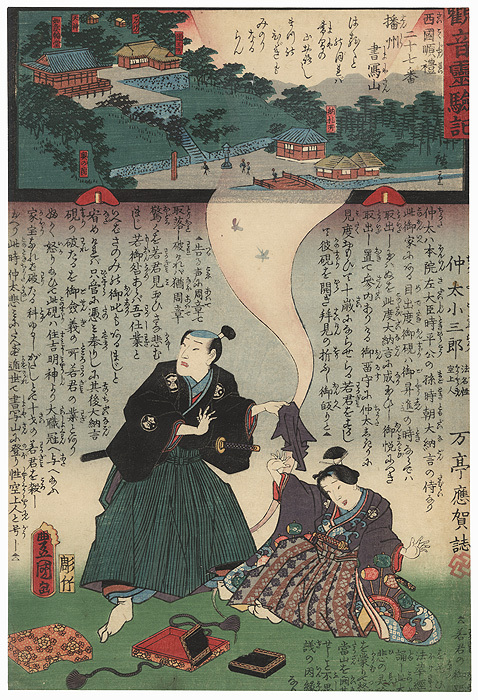 27 of the Saikoku Pilgrimage Route, 1859 - Interesting scene of the samurai Chuda Kozaburo and a young man, startled by smoke coming from a lacquer box on the ground. The cloud of smoke floats up to the inset of the temple above, the shadows of two tiny birds or insects flitting through it. Great detail and fine line work. Image Size - 13" x 8 3/4"
Condition - This print with excellent color and detail as shown. Backed with paper. Slight toning, slight soiling at edges. Please see photos for details.